I went back and forth between telling you this story or not. It was really the quite battle in my head, and despite some of my pride disintegrating with every word I type, the story is funny, so you shall hear it. I know this photographer. He is amazing at what he does. Scenery, urban shots, and yes, people. Not just anyone, you see. In fact, if you look at his pictures, it's mostly beautiful girls. To top it off, he makes them look even more incredible. I know several of them from high school and a handful of them are friends of mine. Needless to say, if you're one of these people, you're going to have some pretty phenomenal photos to boast of. He actually asked to work with me. It's true! I was on my facebook account when I saw I had an inbox from him titled "photos." I went between feelings complete flattery to questioning whether my boyfriend might be mad if I posed in a bikini. I sat and thought it over, got a little excited and then opened the message. "Do you want some professional food pictures?" There went my ego, the chip on my shoulder and a bit of anxiety. Of course he didn't want to take pictures of me...he wanted to take pictures of my glorious food! My pride was then back on the rise. Anyway, so we planned a night to get together and do it, and I was completely blown away by all the fancy equipment and after he left I looked at my cute little Nikon Coolpix like it was white trash. Anyway, it was a blast to see how it all comes together and hopefully every once in a while you'll see a photo that you know I didn't take! Now, onto more important things. When deciding what I wanted to make as my golden child food product, I went through a plethora of ideas. S'more cupcakes? Banana layer cake? Something I've done before? I didn't want to make something just because I thought it was pretty. I didn't want to make something just because it tastes good. I wanted something elegant, delicious and the whole package. I wanted tres leches cake. Now, I've never technically had it before, but it just looks so clean. It's simple but tastes extravagant. You can let it be or you can add colorful fruit toppings over the thick layer of whipped cream frosting. Tres leches is a Latin dessert that gets its name from the three milks you use: evaporated milk, sweetened condensed milk and whole milk (or heavy cream). IT.IS.SO.MOIST. I mean, unbelievably moist. And creamy and wonderful and I could go on and on about this one. Honestly, this is one of the best cakes I've made yet.. and I've had some gems. AND, it's not even chocolate, or anywhere close, so the fact I'm so high on it is astonishing, or should be. The Stars of the Show...The Leches Themselves! Three women at my job, one Puerto Rican, one Bolivian and one... oh rats I forget, said it was the best tres leches they have ever had. Rumor has it that one wants me to make it for her engagement party. Um, I'd love to! Anyway, so it's good-- that good. You should try it. 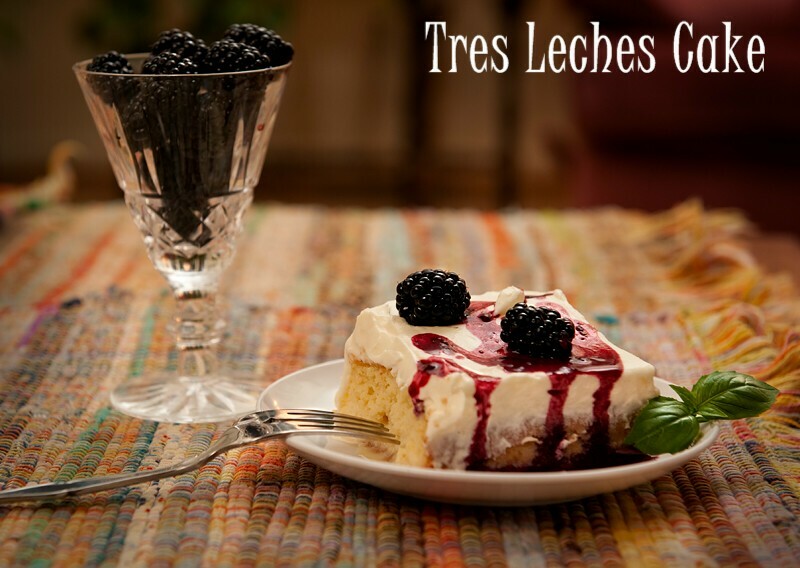 And if you've never had tres leches, you definitely should try it. You'll be glad you did! You know I’m a weight measurer for things like flour now, but I put the approximate conversion too. I like to make sure it’s not too floury, so I bought a kitchen scale. 3. Cream butter and the 1 cup sugar together until fluffy. Don't rush this...You want this mixture to be light! Add eggs one at a time, mixing well after each and the 1/2 teaspoon vanilla extract; beat well. 5. Bake at 350 degrees F (175 degrees C) for 30 minutes. (Here is where you have an option to invert your cake. I didn’t do it, but if I were hosting a party, I might to it for presentation sake.Pierce cake several times with a fork. And by several I mean about 100 times. I pierced it again and again. 6. Combine the whole milk, condensed milk, and evaporated milk together in a separate bowl. Whisk to combine. Pour evenly over the top of the cooled cake. Don’t worry, it will soak in. You might think this cake gets really soggy, but it doesn’t taste bad soggy, just super moist, as I already mentioned. It’s really great, honestly. You should definitely try this one. I topped it with some blackberries, but it would be great with most fruits as a topping. Try kiwi, strawberry, or mango. That’s all for now! Ta-Ta!! aww i love this story! that's cool you still worked w/ him though. i wish i had fancy camera equipment. Great story, Stunning picture and wonderful looking cake, I am a Tres Leches fan! Your cake looks great and sounds delicious. I have a point and shoot too, sometimes I wish I had a fancy camera but I'd have no idea how to use it. Fun story. Hey, at least you got some great food photos out of it. This cake is calling my name! Beauty will fade. your cooking skills will not! wow these pictures are amazing especially the first one. I love tres leches cake. i definitely miss this a lot ! I havent found a good one in nyc yet! I'm glad you shared this story...it made me smile and laugh. And I love seeing these photos and your own photos as well. What a delicious cake! The cake looks delicious! I'm glad your first try ended so well. This is our fav cake! we Love it. Moist indeed! Love the story, and amazing look cake! This is definitely the whole deal and certainly picture worthy :) I'm sure all the fancy equipment would make my meager camera even trashier looking than yours! This cake sounds so delicious!!! And the pics really did come out wonderful. Let us know if you got any great food photography tips to share! I just found your blog through the network and love it!! Everything looks so delicious:)) Gotta love those pictures-- looks amazing. My husband likes to try his very elementary Spanish when we go to Mexican restaurents. Once he tried to order tres leche cake and the waiter brought him 3 glasses of milk. My husband tried again...this time he got three pieces of cake! We still laugh about this! That's some gorgeous cake. Did you learn anything from the photog? About lighting or props? I would have begged him for advice. Oh how fun...The photos are lovely, and you cake scrumptious! Beautiful pictures and one good looking cake, looks absolutely delicious. great photos and man I always want to TRY to make this cake but I never have. It looks so fantastic!!! Kitchen scales are great and these photos are fantastic! The cake looks amazing.. i love tres leches! Those pictures are great! Sadly my photographer friends abandoned me. Totally sounds like something I would do. Minus contemplating the bikini part. Bikinis are my mortal enemy. I tried Tres Leche once, it didn't work out so hot for me. Yours looks great though!! Love the berries you added. 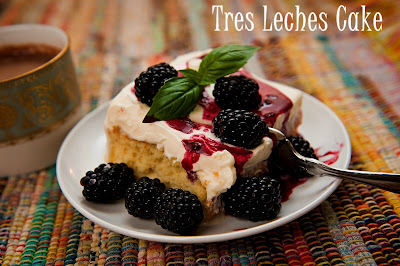 For someone who has never made Tres leches before...it certainly doesn't look that way. Gorgeous presentation and the cake looks heavenly.